This week I had to say goodbye to lovely Asia. 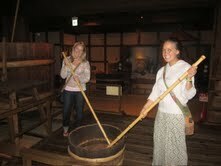 Yet one more experience in Japan made it the best trip ever! Read all about my time there below. We docked in Kobe, Japan and it took us forever to go through immigration. Japanese officials are very…official. Summer and I left for the day and rode the subway all around town. We went to the Kiku-Masamune Sake Brewery Museum and learned all about how to make Sake and then we got a free tasting…not my drink of choice. Then the adventures really began. We had one of our Japanese friends on the ship write “Please take me to Osaka” in Japanese on a piece of posterboard and we stood outside and started hitchhiking! We got picked up within 4 minutes! Everyone was laughing at us and thought it was so funny. The guy that picked us up was a real-estate agent who barley spoke any English. He told us that once he hitchhiked from Mexico to Toronto…impressive. We tried to talk to him for the 30min drive, but the language barrier always gets in the way. I was asking him how many sisters he had and he kept saying 35…I don’t think that was accurate. He thought that we were crazy and he took a picture of us at the end “for memories.” First time hitchhiking=success. We got cup of noodles for lunch and we got kicked out of Starbucks for trying to eat them in there, so we had to eat on the street…which NOBODY does in Japan. You aren’t supposed to eat or drink in public…lots of people were starring. Then we meet up with our couchsurfer, Yuca! She was 23 years old and had a tiny little apartment right outside of Osaka. We all went out to dinner at this cute little Japanese restaurant that was called “I love New York”…what are the odds. 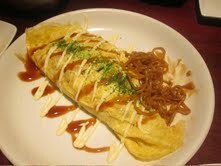 Japanese omelet...filled with noodles? Hmmm, Oh Japan. Woke up and after having sushi and ice cream for breakfast, headed to Kyoto. It is Cherry Blossom season in Japan and it only lasts about a week out of the whole year. They said that people try so hard to plan their vacations around when they think Cherry Blossom season will be, but nobody can ever be sure, so we were so lucky that our trip overlapped with it. It was raining which was a bummer, but we walked around this beautiful area and down “Philosopher’s Path” and saw more Cherry Blossoms than I could count. We went to this food court type area under the train station and ate free samples for lunch…haha talk about traveling on a budget: hitchhiking, couchsurfing, and eating free samples…that is what happens after a few months of traveling. 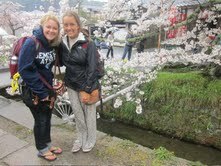 We got day passes for the bus and rode around to all different parts of Kyoto. For dinner we went to a little hole in the wall place recommended by Lonely Planet. It was called “A-Bar” which made it near impossible to ask for directions because every time you asked someone if they knew where “A-Bar” was they would point you in the direction of any bar; a bar…mamma mia. But, once we got there it was totally worth it. The food was great and the place was really neat, everyone who had been there signed the walls and left little messages and quotes and it was a friendly little place. That night we took a 7 hour overnight bus to Tokyo! We ended up on the Ladies only bus, it was the only one available, but it was awesome. Everyone had their own comfy chair with a flowered seat cover that reclined all the way and we had curtains on all sides. The lady next to me kept opening my curtain and asking if I was comfortable, if I was okay, if I knew how to recline my chair, and so on…so funny. Woke up on the bus at 6:30am in Tokyo! Meet up with some more friends and went to Kamakura for the day, a little village an hour outside of Tokyo. Temples and Shrines galor, oh my! We saw the Great Buddha Kamakura, Kencho-Ji Temple, and plenty others. They were all beautiful and we had meet a Canadian man who had been living in Tokyo for 6 years, so he showed us all around the area because it was his day off. That night we went to a baseball game…the Giants Game! Same colors as the San Francisco Giants…weird. The game was in the Tokyo Dome and it was SO much fun! The Japanese people are so funny to watch…they go crazy when something good happens and then all of a sudden it goes dead silent. The Giants won, yay? We got a two person hotel room that night, but to save money we fit 9 people in it…the floor became my new best friend. We toured around Tokyo for a bit. We went to the Imperial Palace were we preceded to take a nap on the grass because we were all tired. WIthin 5 five we had policemen running at us blowing their whistles and screaming in Japanese…I think that meant get off the grass…dumb Americans. Then we went to Harashuku for the day…google Harashuku girls. The Japanese are SO stylish it is crazy! I walked around in running shorts one day and felt like a complete bum. Their style is so unquie…they just mismatch everything with as many accessories as possible. We walked into McDonalds one day to get Wifi and there were two guys sitting their applying hair gel and starring in the mirror…forever. We shopped around the whole day, but I dind’t buy anything…it was SO expensive! We went to Shakey’s all you can eat pizza and pasta for lunch…ha. The toppings on the pizza were SO weird…mayo and shrimp…no thanks. Then we went to another Shrine where a Chinese man preceded to have a photoshoot with us. 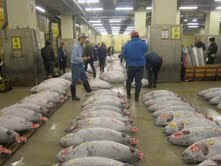 The World's Largest Fish Market! Japan was an incredible place. I don’t really know how to begin to describe it…it is like its own little world, very unique. Few fun facts about Japan: the toilets here are INSANE! They have SO many buttons. You sit down on them and they automatically heat up your seat, then there are buttons you press that water will spray up at you, then there are buttons that will make a fake flushing sound if you want noise while you are using the toilet…sorry to be detailed, but they were so funny. In Japan everyone wears masks…like the ones doctors wear. They wear them if they are sick or if they just want to prevent getting sick…it is interesting. And coughing in public is the equivalent of farting in public, so when you have to cough you are supposed to run into an alleyway to do so. The people in Japan were incredibly nice. If you stood anywhere looking confused and holding a map within 30 seconds you would have someone by your side asking if you needed directions. I can’t believe we are out of Asia, it is so sad. We are headed across the Pacific Ocean now and the seas are SO rough. People are getting sick, we woke up this morning and our room looked like a tornado hit it, our draws were opening and slamming closed every two seconds throughout the night, they closed the gym area because it is too dangerous out, and it goes on and on. Cross your fingers that we make it 🙂 The 100th anniversary of the Titanic was the other day! We are on the ship for 11 more days….ELEVEN DAYS! Ah…what to do. Then Hawaii for a day, then 6 more days on the ship…then San Diego! Time is flying by, I can’t believe it is the final stretch of our trip…so bittersweet.